The 2019 Football season schedules were released today, and while some schools have not released their non-conference schedules, we can take a look and preview some big games coming up in 2019. These two teams will play for the third time in two years with this Week 1 matchup, last year saw them split two games, with Spencer coming out ahead in their Week 1 matchup 27-7. Stratford got the best of Spencer when it counted in a Level 4 game at Medford winning 22-6. A matchup of former Marawood foes, Auburndale lost in Pittsville Week 1 last year on a missed two-point conversion in the second overtime. In what should be an easy win for Marshfield, this game marks the opening of the Kenneth & Ardyce Heiting Community Stadium. Loyal has done a great job scheduling difficult non-conference opponents the past few years and continues this year as they schedule the Bangor Cardinals who have won state championships in 2015 and 2017. This game has become a premier early season test for both schools as they have won a combined 10 state titles in the past decade on 12 appearances, including four state titles in the past three years. The past few years this game has been played Week 9 and has served as a defacto Cloverwood Conference Title Game. This year it is early, but still will hold huge sway over the winner of the Cloverwood. A rivalry looks to be coming to an end as this will be the last year Greenwood will be playing 11 man football. Loyal has dominated in recent years, but with how close the two schools are, it’s still a rivalry. In the 103rd meeting, we see Marshfield head over to Goerke Field to take on the Panthers, Stevens Point came close to ending Marshfield’s perfect regular season last year. This will be the 118th meeting between Marshfield and Wisconsin Rapids which puts it fourth in the state for most played games in high school football. This was a defacto conference title game last season. They play on a Thursday night this year at Carson Park. The big one comes a week early this year as the Stratford Tigers end their conference season with a trip to Edgar. Last year’s game was won on a touchdown by Edgar with 7 seconds left on the clock. And with Edgar making a trip to Tomahawk and Stratford playing a non-conference opponent, this should again be a defacto conference title game. This also looks to be the last time this game will serve as a conference title game as Edgar and Stratford would be moving to two different conferences in the 2020 realignment plan currently being debated by the WIAA. Mosinee and Medford will play for the Cheese Grater for the second time, Mosinee is the current holder of the new trophy winning at home 42-28. This was the game of the year in Central Wisconsin in the late ’90s and early ’00s, even though it has lost some of its luster, it’s still a rivalry game. 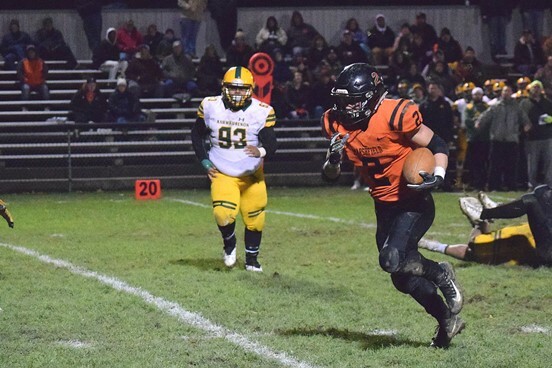 A rarity in recent years we see a Week 9 without many big rivalry games, one of the few this season in the area is Amherst making the trip to Iola-Scandinavia. Iola won their first conference title in recent years by winning at Amherst Week 9 last season. This is another rivalry that looks to be moving out of conference as these two teams would also be split up in the 2020 football realignment.